Friends and acquaintances of Sergeant Danny Wikstrom from SCVSAR, cooperating agencies, and the general public are invited to Taylor’s Landing to join us in recognition of Danny’s retirement after serving over 30 years in Law Enforcement with the last 22 years as SAR Sgt. and Air Support Unit Supervisor. If you would like to schedule an event with one of our teams, please contact 425.388.3328 for more information. Adventure safely! Washington’s wilderness offers extraordinary beauty, as well as hazards to those who venture unprepared. Use the checklists and resources on this page to enjoy the wilderness safely, and know what do in an emergency. 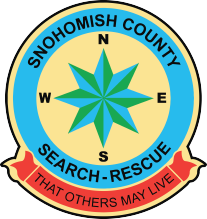 Reference in this site to any specific commercial product, process, or service, or the use of any trade, firm or corporation name is for the information and convenience of the public, and does not constitute endorsement, recommendation, or favoring by Snohomish County Volunteer Search and Rescue, Inc.
Research the area you’re visiting, including trails, rivers, and nearest roads. Pack your 10 essentials including your map and compass. Bring plenty of water, or know where to find it and how to treat it. Take a loud whistle or air horn to blow in case of emergency. Leave a hiking plan with friends or relatives, and stick to it. Stay calm. Most hikers and backpackers can figure out their location after a few minutes consulting their map and compass. Try backtracking until you find a landmark or point of orientation. Seek higher ground to spot landmarks. But don’t veer too far. Blow a whistle or air horn at regular intervals to alert hikers nearby. If you’re lost or injured, stay put, and if possible, in open area where you can be better spotted. Activate your PLB (personal locator beacon) or SPOT if you have one. If unable to complete a call, try texting. Often times texting will get through when a call cannot. Wear bright clothing, and continue sounding whistle/horn. Stay dry, hydrated, and off the ground. Use your equipment to shield from the elements. Remain calm and conserve energy. Most of those lost and injured in the wilderness are rescued safely with 48 hours. Washington Department of Natural Resources (DNR) - Wet Weather Can Trigger Shallow Landslides, Do You Know the Warning Signs?